I’m a television freak. If you add travel into the TV mix, I’m even more fanatic about it. That’s why I love Thursday night television. CBS has Survivor and ABC is airing new episodes of LOST. Ala Moana Center – Take a ride up the escalator and shop at what was the airport scene for the Oceanic ticket counter. 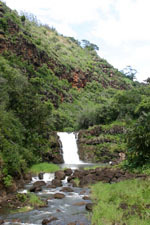 Waimea Valley – This site is home to the infamous waterfall where Kate and Sawyer retrieve guns in the first season. There are also trails that are oddly familiar from the first season. As of February 1, 2008, this historical site has returned to the hands of the Hawaiian people. It was recently an Audubon Center. It is unknown at this time if the waterfalls are open to the public for a dip. I do know that the falls have something special in them for the skin. My skin was softer for at least three days after my swim. This is definitely a special place that should be visited while in the islands. Dillingham Airfield – During my visit, I snuck around back and found the storage for the fuselage. I also took a glider ride that provided a glorious view of the beaches. It is also the airfield setting for the episode “The 23rd Psalm” which gives some background about Mr. Echo. Mokule’ia Beach (Army Beach) – This is directly across from the airfield and was the beach setting for the pilot episode. Ka’a’wa Valley – The LOST survivors played a few rounds of golf in this area that was also a film site for Jurassic Park, Godzilla, and Pearl Harbor. Do you want to play on the course where Sayid shot the guy? Visit the 17th hold of Turtle Bay Palmer Course. Want to see more? Check out Lost Virtual Tours for pictures and videos of even more film sites. I’m looking forward to tonight’s episode. I wonder what crazy conspiracy will be revealed.